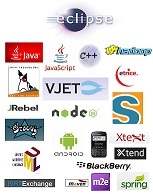 Non-official satellite site page is [http://eclipse-china.github.io/Day/ eclipse-china.github.io/Day/]. 如果你要从另外的城市来，请联系我们能不能帮助你们。I you are coming from other city please contact us if we can help you. 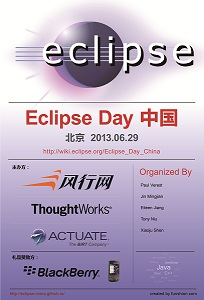 Register for next event at http://eclipsenovemberday.eventbrite.com/ . UPDATE: Suggested time slot duration is 30 minutes (including Q&A, preparation for next presenter). We are to run 2 demo tracks + Hackathon track. Time slot duration is 30 minutes (including Q&A, preparation for next presenter). We run 2 demo tracks + Hackathon track. Chinese PC market is now the biggest in the world. Registrations is closed. Limited number of guests (up to 10) can join remotely via WebEx. Contact organizers. If you are coming from other city (not Beijing) or want to do demo or help around on Eclipse Day, please contact organizers. We need person who will lead Track 2 (come with notebook, connect with remote presenters, be whole day on the site). Speakers and co-organizers are still welcomed!. The event is free, please register ASAP to reserve your seat. 此次活动免费，因席位有限，请务必尽早注册预留席位。 For guests (not presenters) without registration a processing fee of 100 rmb is applied. Time slot duration is 30 minutes (including Q&A, preparation for next presenter). We run 2 demo tracks + Hackathon track. Limited number of guests (up to 10) can join remotely. Contact organizers. The maximum number of attendees (including speakers) was 100. The registration is still open. Thanks to ThoughtWorks. This page was last modified 22:42, 27 August 2013 by Paul Verest. Based on work by Thomas Schuetz, Eileen Jiang and song he and others.